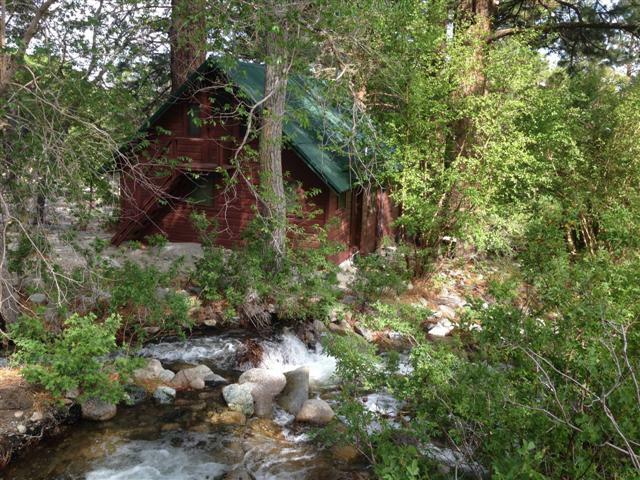 Rustic cabin on USFS leased land located right on the stream! Dine al fresco every day under the Ponderosa Pines and right by the Independence Creek. Located a few miles west of Independence, CA in the popular Seven Pines Tract. A exterior Honda generator is for inside lighting, propane powers refrig, stove and hot water heater. Cabin has propane lights in the living room and kitchen. On shared septic system & water system. Water comes directly from stream. Recently painted exterior and metal roof. Newly re-plumbed throughout. 1 bedroom downstairs, dormitory style sleeping quarters upstairs. County-plowed road to within a short distance from the cabin allows for winter use if desired. Fishing, hiking & backpacking is available just outside your door! Onion Valley, Kearsarge Pass and Mt. Whitney are all very accessible from this great location! The historical town of Independence is located in the beautiful Owens Valley. The Eastern Sierra Mountain range offers so much to a variety of people. Where else can you find so many great activities right in your own back yard like fishing, hiking, camping, and biking, skiing, and other snow play? The Sierras have many historical, informational, and exciting experiences to have had like going to Onion Valley, Mammoth Mountain, Manzanar, Mt Whitney, Ancient Bristlecone Pines, and many more. Come experience the fun! Hi, I see this posting is old, is this property still for sale? This property has been sold. We would be more than happy to contact you with some similar property that may fit what you are looking for.